Planning a bathroom revamp? Before you dive in, it's important to nail down your desired aesthetic —whether that's midcentury, modern farmhouse, or industrial. If you fancy the latter, consider concrete bathroom countertops. Not only is this modest material durable and easy to maintain, it's super chic. Not sold yet? Take a gander at these 13 self-care sanctuaries that are sure to turn you into a believer. Three words: sleek, streamlined, symmetrical. 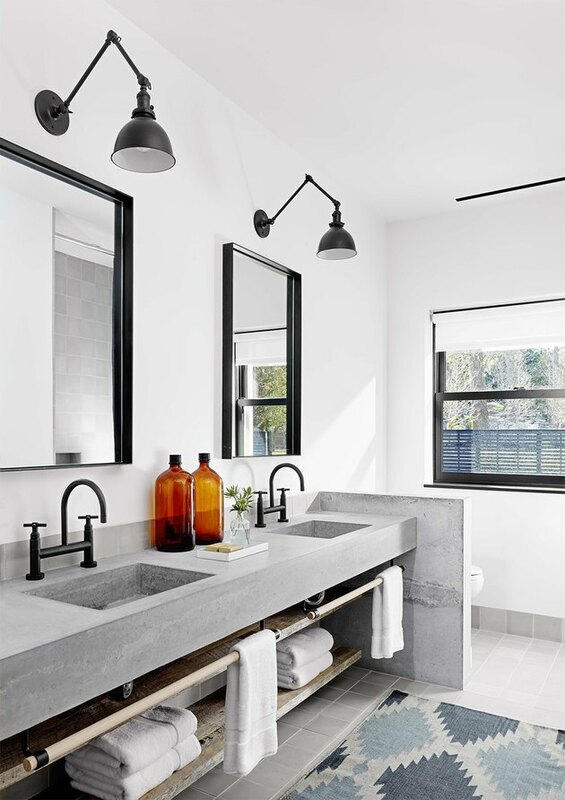 The combination of concrete countertops, black accents, and a two-tone geometric rug in this industrial bath designed by Aamodt / Plumb is oh-so cool. It's minimal, but not stark. Who says this unassuming material can't be glam? 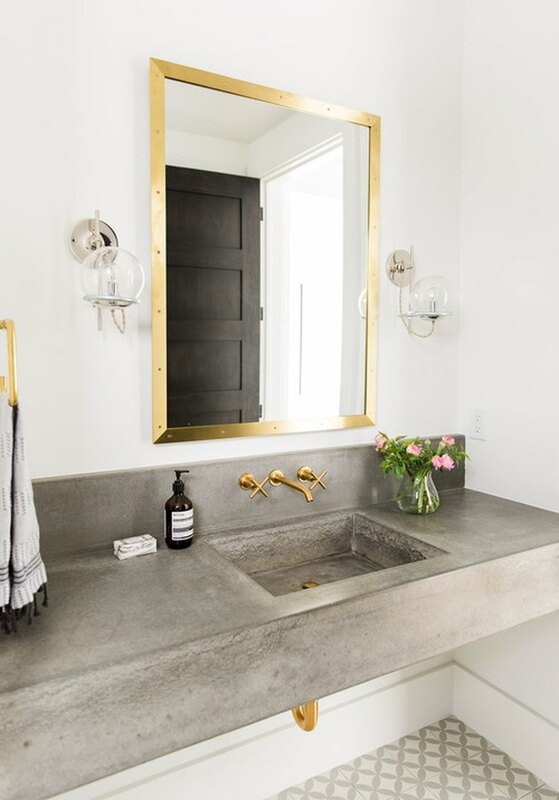 Gilded touches in this bath designed by Shea from Studio McGee offset the tough nature of the concrete vanity. Cement floor tile and a vase filled with pretty pink blooms add a soft, slightly feminine quality. 3. Or, clean and modern. 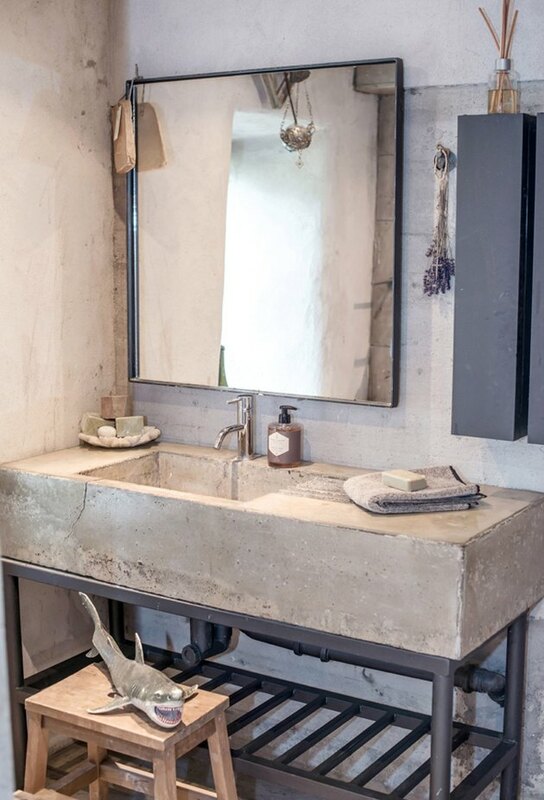 The custom vanity topped with a concrete slab is definitely the focal point in this Waco, Texas bath designed by Joanna Gaines. 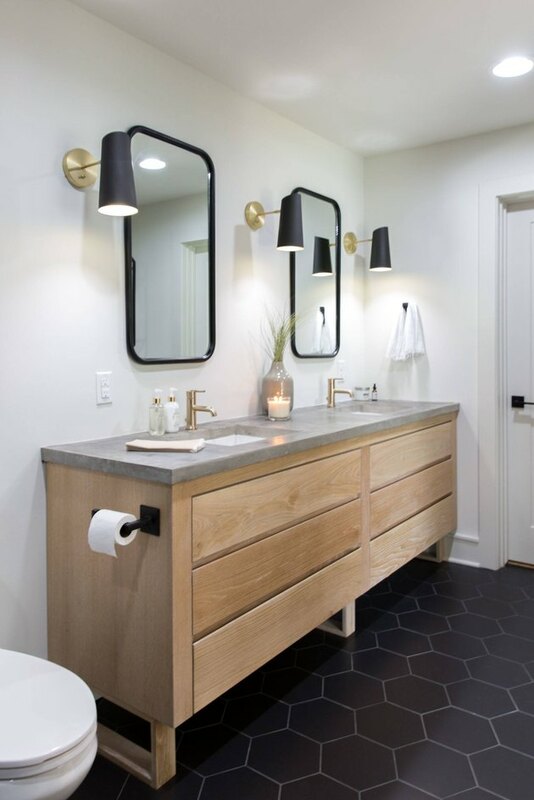 Modern hexagonal tile adds interest to the floors, while the black hardware, mirrors, and wall sconces look gorgeous paired with brass faucets. 4. Classic black and white is always a winning combo. 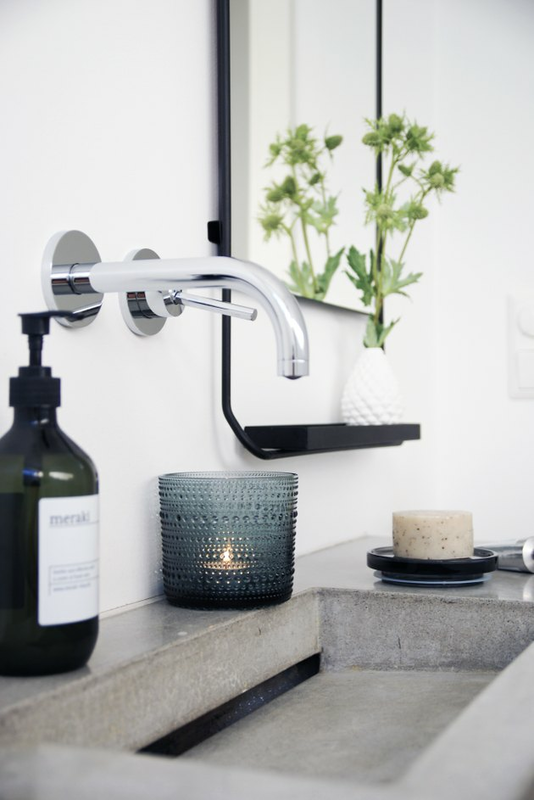 This bathroom designed by Raili Clasen is proof that black and white will always be a classic. 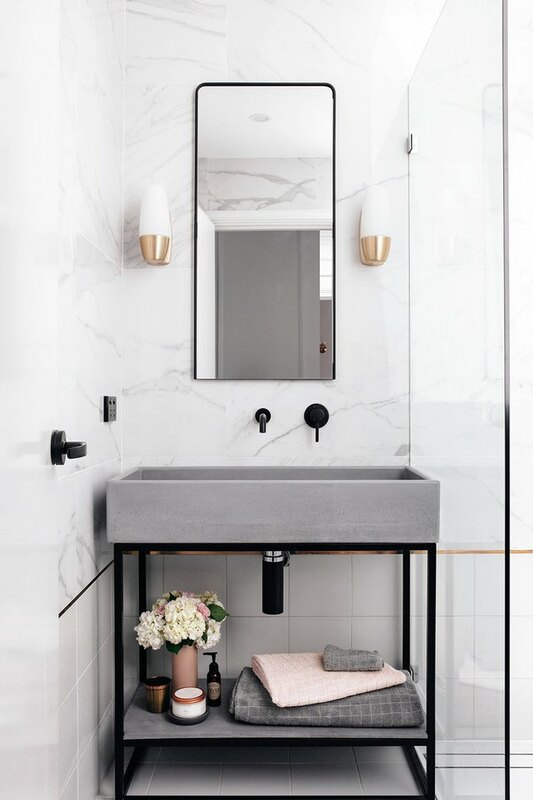 The black floating vanity, topped by a long trough-style sink, is complemented by black fixtures and black and white Swiss cross floor tile resulting in a space that's modern yet playful. 5. Stick with a classic scheme. 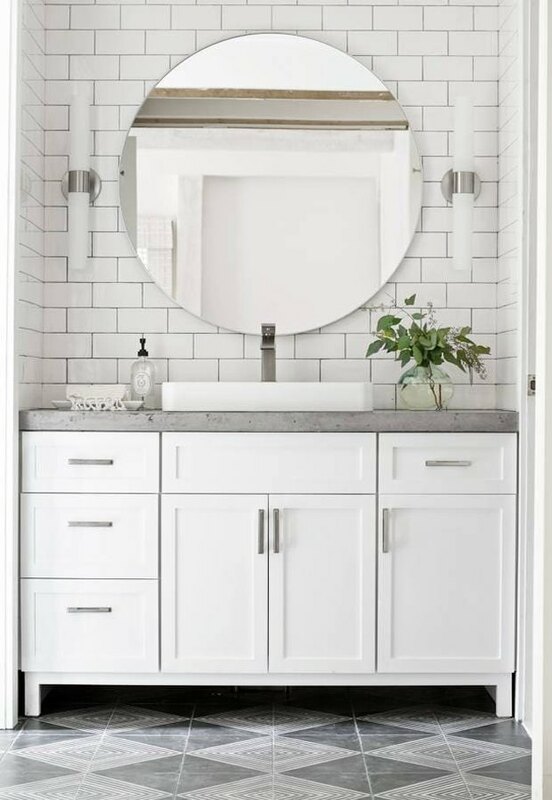 A palette of gray and white is timeless in this bath designed by Sarah Dorsey, which gives you license to have some fun with textures, patterns, and finishes. Can we talk about the ceramic floor tile? And the large round mirror that reflects light and really opens up the space. 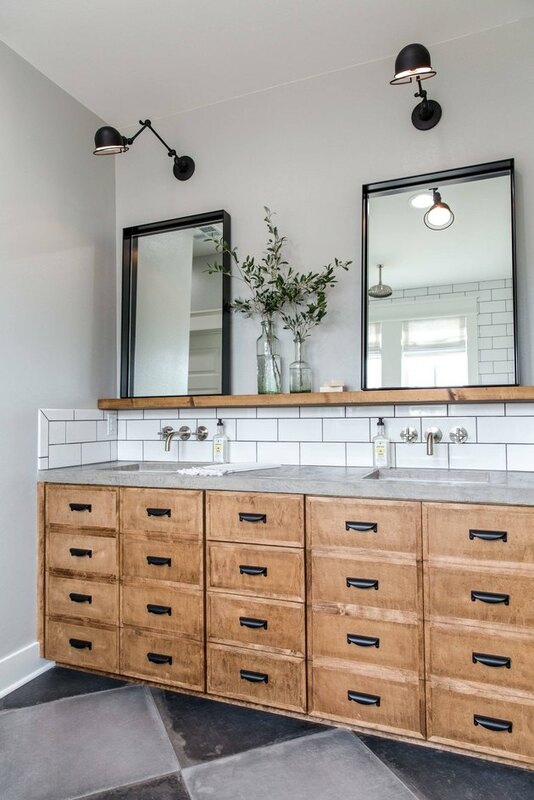 We love the interplay of concrete and wood against the backdrop of a white subway tile backsplash in this rustic bathroom designed by Joanna Gaines. Black accents and a hint of greenery complete this industrial oasis. This Stockholm abode used to be a brewery. And the bathroom is a reflection of that. The ample use of well-worn concrete imbues an industrial vibe that pays homage to the home's historic roots. There's a difference between keeping it simple and playing it safe. Case in point: This serene sanctuary belonging to interior designer Elisabeth Heier that embodies the best elements of Scandinavian design. 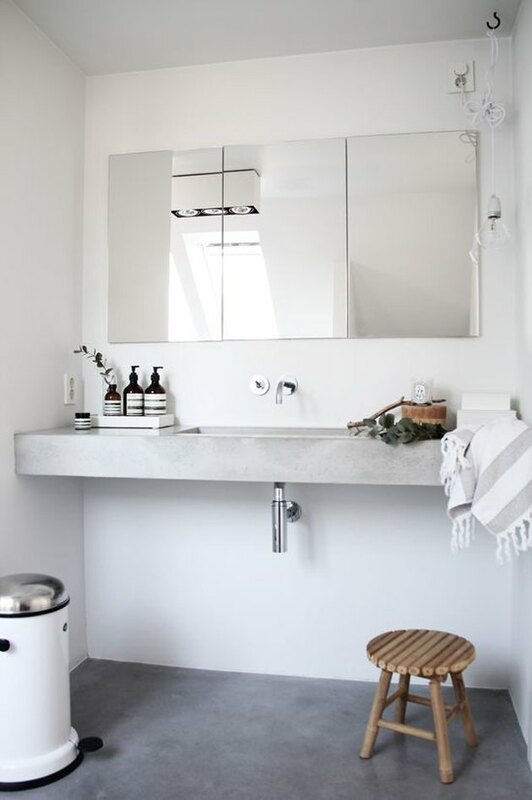 From the raw concrete countertops to the Aesop toiletries, it's perfection. Rustic meets romantic in this master bathroom designed by Justine Hugh-Jones. 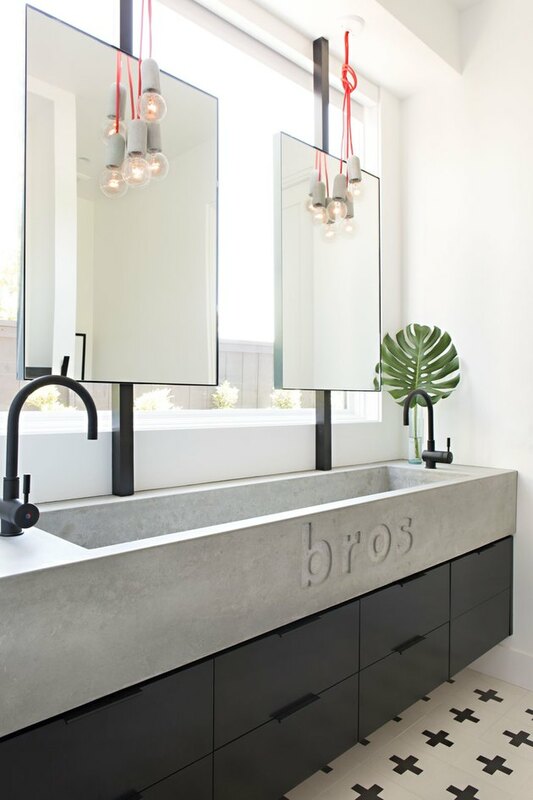 Concrete countertops lend a hint of ruggedness, balanced by the refined beauty of mirrors with metal frames and gooseneck faucets. 10. Be selective with accessories. White walls and concrete countertops are a blank slate. But if left unadorned can read a bit sterile. Lene from Funksjonelt injects personality through accessories — including a blue votive candleholder, hand soap, and small bud vase. 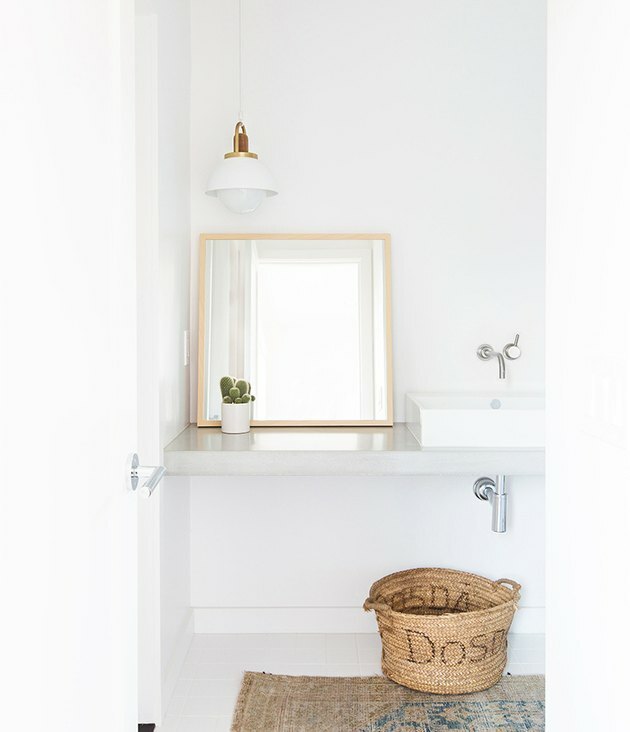 A concrete floating vanity, vessel sink, and wood frame mirror lay the foundation for this minimalist-inspired powder room designed by Amber Lewis. Earthy decor, such as a woven basket, area rug, and tiny cactus add a dash of coastal charm. 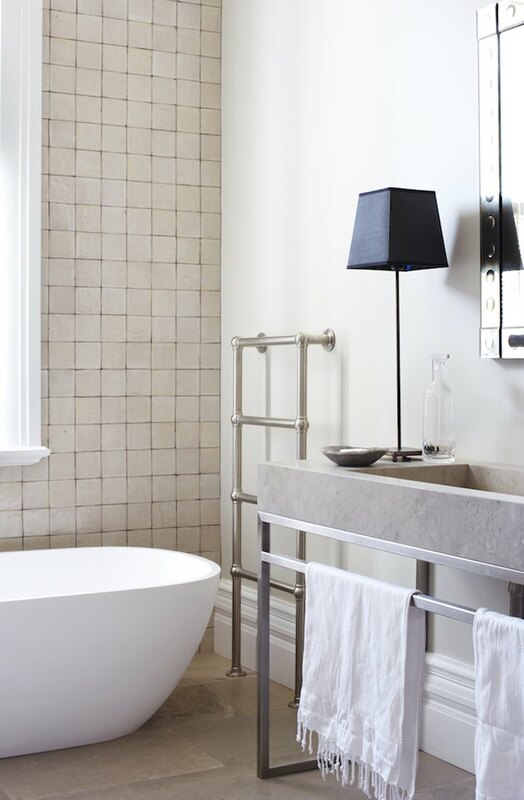 Your bathroom should be a respite of relaxation. When it comes to unwinding after a long day, you can't beat a deep soaking tub like the one in this space designed by Justine Hugh-Jones. The wall and floor tile imparts a sense of warmth that tempers the rawness of the concrete. 13. Opt for a concrete sink instead of a countertop. Be bold. Be daring. Live life on the wildly unpractical side (at least for those that typically prefer counter space), and go sans countertop. 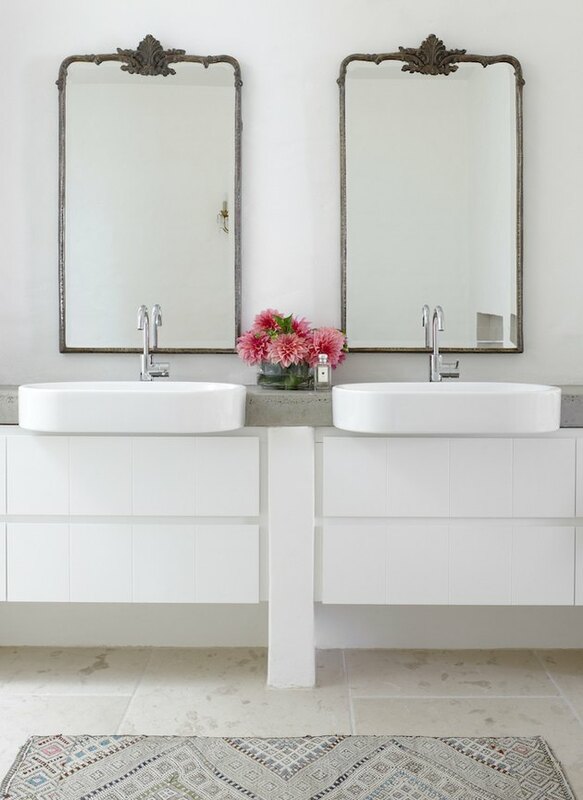 Matt and Kim Di Costa opted for a concrete sink instead in their powder room, and the result is gorgeous.